There has been a wonderful influx of agoutis Dasyprocta leporine (or in their local name “goutis”) around our bird feeding tables below the verandah recently. These lovely creatures are quite tame close to the Main House, but visitors will find that the farther they walk along the trails, the agoutis become more skittish and likely to dart into the undergrowth. Obviously, those who have been feeding closer to the House have learned that humans at AW are not threats, but rather providers of food! And the food we put out, and which drops from the bird feeding tables, has become more welcome to these happy little animals. And for good reason: Much of the fruit in the forest, like mangoes and wild (“hog”) plums have already fallen and disappeared. When the forest floor is covered in fruit, the agoutis are more likely to stay out in the forest, with only a few “regular residents” staying close to the verandah. So, with the forest slightly bare of fruit, visitors to the Centre can enjoy seeing several agoutis, including many young ones, around the house, seemingly quite comfortable to share the space with us. And we certainly welcome them here. Small animals have had a rough time this year in Trinidad. The long drought earlier this year provided tinder for fires which climbed out of the foothills “bush” into the mountains and destroyed many small animals and their habitats. This is the hunting season in Trinidad and Tobago (it runs from October through April each year), and agouti are “popular” with hunters, who enjoy their meat. But they are safe within our estate, and maybe they are learning this, and are coming here for refuge. Environmental groups have called for a ban on hunting to allow populations to revive, but this has not happened. However, a petition is being circulated to prevent the commercial sale of “wild meat”, the local forest animals which are hunted. This is admittedly a compromise being suggested, which will permit hunters to take for themselves, but not to sell commercially. The benefits to our wildlife are obvious. Asa Wright supports this petition, and we ask you all to join by opening and signing on this link: http://www.gopetition.com/petition/39310.html. Your support will ensure that these lovely little animals, and others, will thrive in the forests beyond the sanctuary of Asa Wright. The forests of Trinidad’s Northern Range provide habitat for many species of snakes, although most of these are not venomous and will not harm humans. And of course we have seen many of these beautiful reptiles here at Asa Wright, and sometimes we need to “relocate” those that come too close to our cottages. You will recall in September’s issue of the Bellbird that we featured Winston Rojas, our resident snakehandler who does the relocation of our snakes when necessary. So it was only fitting that when the Emperor Valley Zoo began conducting Snakehandling Workshops in Trinidad and Tobago, that they would visit Spring Hill to share experiences with Winston, and to tell our staff and visitors about the animals and reassure everyone that the fears we harbour are really unfounded. And to conduct this workshop in the Jonnie Fisk Conference Centre, they brought some snakes to visit us, and which were used in the snakehandling demonstrations. The Emperor Valley Zoo staff members were Delbert Charleau, Kishore Ramlogan, Safiyah Khan and Sharleen Khan. 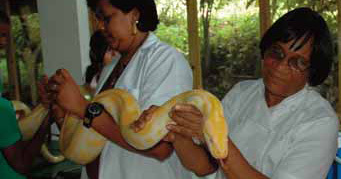 The snakes which they brought were three “local” residents and one “expat” – a huge Albino Python from Burma. The “locals” were a boa constrictor, or Macajuel, a Rainbow boa and the Tigre. Delbert Charleau demonstrated the techniques for handling these snakes, and also advised on the methods to deal with venomous snakes. Participants in the Workshop included a crosssection of the Centre’s staff, plus visitors to the Centre, who especially appreciated the opportunity to handle the snakes and realise that their fears of them are largely unfounded. One of the key points expressed was that snakes do not want to harm people, and will only bite if aggravated or trod upon. We wish the Emperor Valley Zoo and the Zoological Society every success in their ongoing workshops, and trust that people will begin to appreciate these animals more and fear them less. 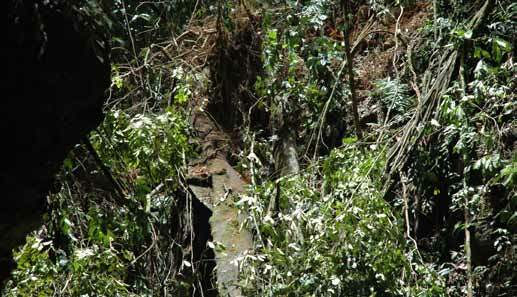 Following the devastating dry season earlier this year, we saw the forests begin to sing again with the April showers. And now, in August we are seeing rainfall to make up for all the deficits of the dry season! At the Asa Wright Nature Centre the rainy season brings a different ambience to the forests. Mostly, the early mornings are fine, with stars shining bright in the pre-dawn sky. Our birds sing loudly with the daybreak, the antshrikes and mocking birds being the first to serenade. Clouds of mist rise out of the valley, different hidden streams sending up their mist at different times, like alternating puffs of steam. But as beautiful as this rising mist is, it is going up to become the afternoon clouds, and to bring the afternoon rains. And these come in over the ridge to the east, roaring as loudly as waterfalls, until they arrive at the Centre, pounding on our roofs for a while until they move on, far more silently than they arrived. In the wake of each passing shower, the birds begin to sing again, and the elusive Mot Mots come out to the feeding tables below the verandah, joined by noisy Oropendolas with their young, now learning to feed themselves. Above them flit half a dozen Jacobin Hummingbirds, flashing their green, blue and white iridescence in the sudden sunlight. An after-rain walk along the driveway will see you regularly challenged by the red mountain “manicou” crabs, which come out to forage. These are aggressive creatures who will snap their claws at you. However, they are also the favourite food of the Great Black Hawk, so you should be on the lookout for these raptors, perched close by, or even feeding along the road! Along the trails the raindrops continue to fall from the treetops long after the shower has passed. The sunbeams which filter through holes in the canopy focus on the sights you should see — spotlighting brilliant red Chaconia flowers set amidst the shades of green; a tight geometric spider web, with rainbows shining in its glistening raindrops; or a brilliant blue marbleu butterfly, sparkling like a sapphire in the sunbeam! 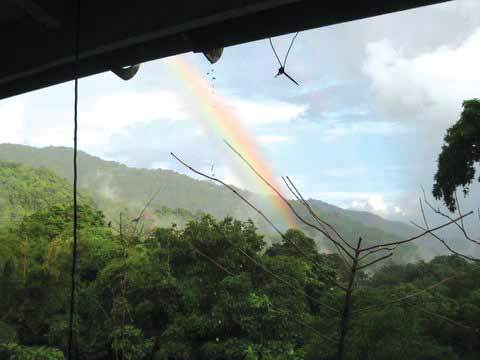 And sometimes the afternoon showers spring forth brilliant rainbows across the valley! Persons lucky enough to be on the verandah at these times may see a flock of Orange-winged parrots flying home across a rainbow! And Rainy Mountain nights… when the full moon wears a faint rainbow halo, or if the night is cloudless, the stars shine brightly through the rainwashed sky. Nights when you see the lightning dancing in the distance beyond the valley, or when you lie, half awake in your cottage, listening to the night, the streams below chattering to you, and the passing rains quietly pattering upon the roof! Most people visit us in the northern hemisphere winter, our dry season. But Asa Wright has many moods, and the Rainy Mountain time is a mood you should experience. 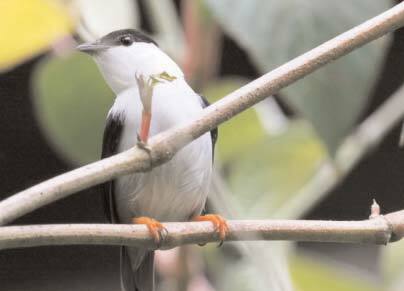 Birding along any of Asa Wight’s forest trails is sure to produce countless flights of avian fancy as some of the Centre’s feathered citizenry show off their brilliant colours to mates, rivals and bird watchers alike, while others display intricate foraging behaviour and delightful courtship performances. But not every animal that flies over the head of an overwhelmed birder on an Asa Wright trail is necessarily a bird. Indeed, many birders have been beguiled away from focusing their binoculars on a target bird by the distracting swoop of another master flier patrolling the forest path just a few feet overhead. Sac-winged or White-lined Bats, Saccopteryx sp., are found in most forest habitats, and although these bats are commonly seen flying and hunting mosquitoes and other small insects during the day in Trinidad, this behaviour is actually very unusual elsewhere in their range. There are two species of White-lined Bats recorded on the island, among Trinidad’s almost 70 recorded bat species. 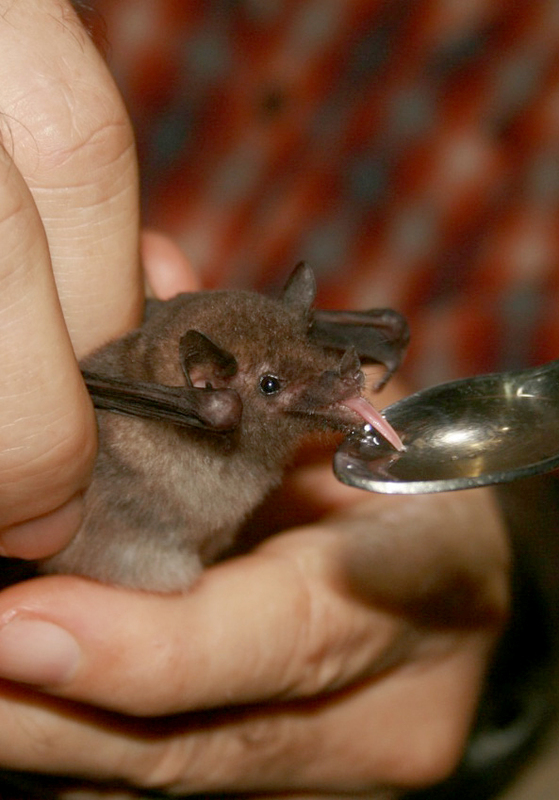 The Founders Circle of the Texas-based organisation, Bat Conservation International (BCI), visited Trinidad and the Asa Wright Nature Centre twice this year during the months of January and May. The BCI tours were led by BCI President and Founder Dr Merlin Tuttle, mammal field guide author Fiona Reid, and Trinidad-born wildlife naturalist Geoffrey Gomes. Both islandwide tours were highly successful with a total of 27 bat species caught and/or observed during the January trip, and 32 species during the May trip to Trinidad. At Asa Wright itself, nets were positioned in various locations but the most productive were those placed along the Discovery Trail, where, in just two hours, 14 species of bats were caught in mist nets. To provide a bit of perspective, when the BCI Founders Circle visited Uganda in 2009, they caught a grand total of 15 species of bats in their entire two-week visit! Bat species caught on the property were carefully bagged and taken back to the Asa Wright verandah where the three guides conducted an after-dinner “show and tell” for the 11 tour participants. After the display, each bat was safely released to continue its nocturnal foraging activities. When the rains finally arrived in April, they were more than welcome, in many respects. But they did bring with them some problems for Spring Hill, with many dried trees and branches absorbing the rain and falling across the estate’s trails. Some of these damaged the metal railings on steeper sections of the trails, and repair work is now in progress. However, down at Dunston’s Cave – the home of our famous Oil Bird Colony – a large tree above the entrance to the gorge uprooted itself and fell down into the stream below! It hung down over the front of the cave like a huge pendulum, blocking anyone from entering, and damaging the railings and walkway into the cave. And when it fell, it brought down all the neighbouring vines and some smaller trees, all of this leaving a large opening in the forest canopy above the gorge. Those familiar with Dunston’s Cave will appreciate that it is really a river gorge through which the stream flows. Parts of the gorge meet at the top forming a tunnel, but this with some openings to the sky. The loss of the forest canopy above the cave caused a lot more sunlight than usual to shine down into the gorge, and this gave rise to concerns for the birds with the interior of the cave becoming brighter in the daytime. We had no choice but to cut the dangling tree trunk and then remove all of the branches and vines from the cave entrance. This was not only to restore the entrance, but to ensure that future heavy rains did not wash it all into the cave, possibly creating a dam inside. The work had to be done with chain saws, but the birds seemed to accept this, and subsequent bird counts indicate that, although the birds are deeper into the gorge, they are all still there. Steps are being taken to revegetate the slopes above the cave, so that the original canopy will eventually return. However, the good news is that despite the trauma of the crashing trees and the subsequent clearing work, our Oil Birds seem to have settled back comfortably into Dunston’s Cave. When we suffered that long dry spell, and the forests in the valley below were burning every day, and through the nights, all of the songs of the forests dried up as well. trickled down the valley. Even the many little musical streams which cross under the road had dried up and become silent. But then the Cicadas began their “song” – that intense shrieking monotone which we claim is a call for the rains. And the rains soon followed – gently at first, just to cool the leaves in the canopies, the drops hardly reaching the crackling dry leaves underfoot. And with this cooling, our little frogs began to move closer to the buildings and the road, and brought their songs with them. The birds too came out, to shake their feathers in the raindrops, and sing lustily from every perch. As the Hog Plum trees began to flower, you could hear the background humming of the bees high in the canopies. And then the little streams themselves began to flow again, and a walk along the driveway provided lovely little melodies in stereo as the notes upstream complemented the downstream beat. And having kissed the hilltops with their cooling breath, the clouds come larger now, literally pouring over the Guanapo Ridge, and pouring sheets of rain into the valley, with a roar as loud as an overhead jet plane, hide the hills from view. This too soon passes, and the birds sing again, the forest slowly shakes itself dry, and the little streams rise in a crescendo of crashing water and chirping frogs. The Rain Forest has returned to us. For the rest of us not preparing for exams, this bright and beautiful revelation is a sign that the dry season is nearing its end and we prepare for rain – much needed after this year’s harsh dry season and the reckless burning and desecration of so much of our forests. Fortunately for us at the Centre, we have been spared the ravages of the flames which consumed so much of the lower reaches of the valley, and we are especially fortunate to still have the opportunity to enjoy the blossoming of our Yellow Poui Trees. 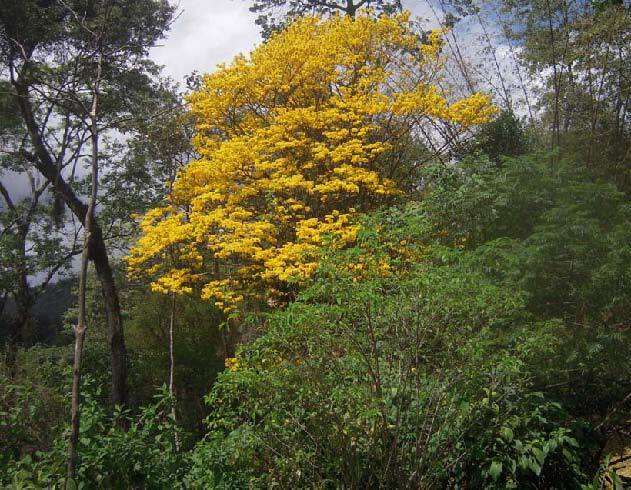 Come quickly to see these Spots of Gold as they brighten the hills of the Arima Valley. clouds of dust rising out of the quarries. hear the distant roar as rain drums down upon the canopy, washing clean the dust of man from the leaves, and pulling a deep grey veil of cleansing across the hillside, and concealing for a while the scars of quarrying in the valley below. And when it passes – as suddenly as it arrived – the valley below finally exhales and pours clouds of mist upwards into the sky. And the streams along our driveway will sing to us again, as will the frogs and crickets and the birds. Until then, we wait, and dream, of the sound and the scent of rain. Will you be here when it comes? just outside the western end of the main house. 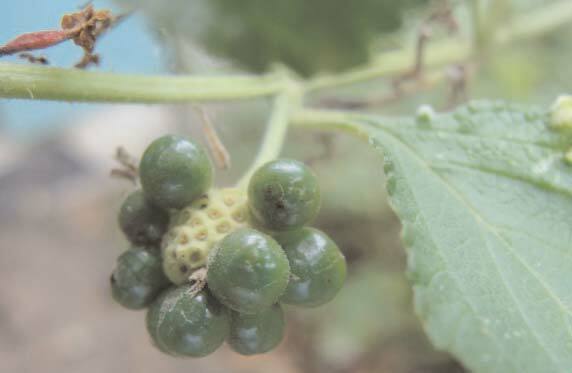 Melastomeceae when not in season.